Wow is there a lot going on in this deck. This is another one of those rogue Modern lists that you can't help but be impressed with. So many moving pieces coming together to form a cohesive machine. The core of the deck--Faithless Looting, Cathartic Reunion, Goryo's Vengeance, and Griselbrand-should be familiar. We know that combo is incredibly powerful due to its speed, but it suffers from a lack of resilience since it's vulnerable to graveyard hate, discard spells, and counterspells while needing to assemble a lot of pieces in a short time frame leads to a high fail rate. Typically you'll tutor for Necrotic Ooze, which can then gain the abilities of Griselbrand and Borborygmos Enraged for a typical Grishoalbrand kill. There's also a singleton copy of Razaketh, the Foulblooded, which combines nicely with Bloodghast to let you assemble this quick rather quickly. Noose Constrictor is the other enabler that lets you pitch your reanimation targets in the early game but also synergizes with Necrotic Ooze and Griselbrand for some combo kills of its own. That it's a creature lets you have some games where you go on the beatdown against a card like Rest in Peace. That's also the role Tasigur, the Golden Fang looks to serve at first glance, an efficient attacker when combined with your card filtering, but it also synergizes perfectly with Eldritch Evolution, offering you a way to jump the curve to your heavy hitters while almost entirely avoiding the graveyard. The last part of the deck is the dredge element. 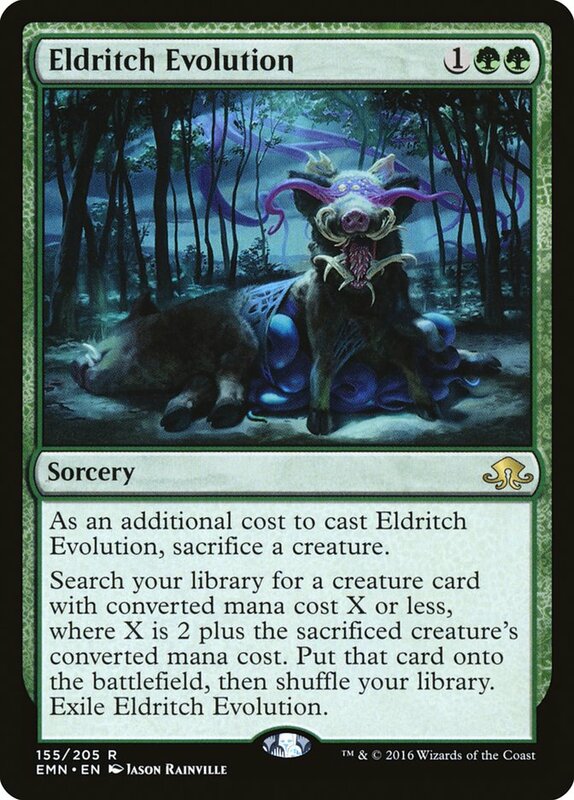 It lets you fill the graveyard for Necrotic Ooze or Goryo's Vengeance while potentially providing a needed creature to sacrifice to Eldritch Evolution or in the case of Life from the Loam, lands to discard to Borborygmos Enraged's ability. Much like in the Dredge deck, those cards provide velocity to a non-blue combo deck. Magic is so hard, and deckbuilding is among the most difficult parts of the game. There's a reason most players simply tune an existing list, and that's because finding and developing a new shell is too daunting. But Modern seems to bring out the brewer in everyone, with so much untapped potential. This list draws inspiration from known decks but before seeing it I would've scoffed at the notion of combining Goryo's Vengeance and Eldritch Evolution. And yet it works.